1. 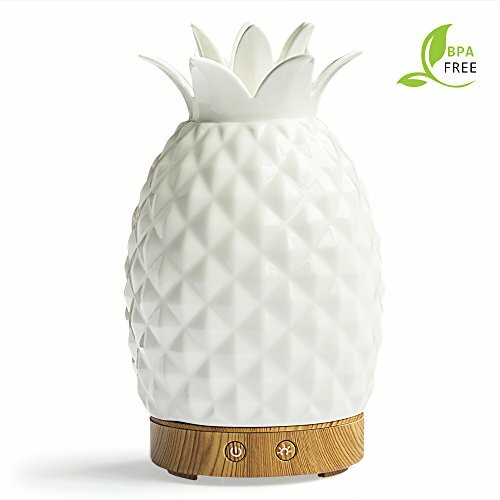 The Pineapple energy-efficient Ultrasonic Cool Mist humidifier brings healthy moisture to the air without adding heat maximizes the air. 2. Moisture in your rooms for a comfortable night's sleep. Its output of more than 2 gallons of moisture per day helps relieve dry coughs. 3. Nasal congestion and cold and flu symptoms in whisper-quiet operation. It also soothes dry skin, chapped lips, sore throats and nose, bleeds. 4. Perfect for rooms ranging between 20~30m². Everybody will love its adorable Pineapple design. 5. Perfectly suitable for bedroom, office, living room, bathroom, conference room, hotel, yoga clubs, fitness center, SPA center, etc. 6. Adjustable light: press the LIGHT on, you can choose between ON/OFF for the LED light. If you press this button every time, the light color and brightness will be changed,14 color changing lamps make your room romantic. 1. Dimensions: 4.75" x 4.75" x 7.1"
7. Room Size Range:100-300 sq. ft.(20-30m²). 8. Run Time per Fill: 4.5 hour. 11. Auto shut off when tank is empty. 1 x Owner's user Manual Includes GIFT BOX for convenient gift giving. THE ROUND RICH ADVANTAGE: Quiet and Healthy.The Fog is more fine and more uniform,spread quickly. Not only has a humidification,aroma,night light function is a grade of the crafts. 14 Soothing LED Light:The color can be cycled through or set it to one fixed color. .press the button for 3 seconds light turn off. easy to use.soft light creates a calming and romantic atmosphere. Shuts Off Automatically When The Water Runs Out. BPA Free! Ensure 100% safety with BPA free material. No harm for baby. A health home for your lover. Portable for Home, Yoga, Office, Spa, Bedroom, Baby Room. Perfect gift idea for family and friends who love aromatherapy or can benefit from Aromatherapy healing. WHAT YOU GET:1 Host,1Adapter,Instructions.our worry-free 18-month warranty and friendly customer service.click and add to cart now. If you have any questions about this product by Round Rich, contact us by completing and submitting the form below. If you are looking for a specif part number, please include it with your message.